Like many of you, I spend some time on FACEBOOK. For the most part, much of the stuff that takes place there is pure fluff and an absolute waste of time. Personally, I don’t do much more than post links to my blog, shamelessly promote my love for my Cleveland Indians and Browns, comment on the pages of a few friends and quickly spy on what people are doing and saying. As far as my “status” on FACEBOOK, I try to add real, original, humorous or thought-provoking posts. Most times I fail at the humor and thought-provoking part but I try to keep it positive and representative of what I want people to see from me. If at all possible, I try to point people to consider Jesus Christ without trying to preach sermons on my status as some people try to do. If anything, these “sermons turned to status” turn me off. Especially when my honor, loyalty and my relationship with God or Jesus Christ will be called into question if I don’t re-post it. That being said, I have always noticed a disturbing trend on FACEBOOK. As I surf the “home page” of my FB account, I have noticed that most of the status updates are just opportunities for people to whine and complain about something that is going on in their life. 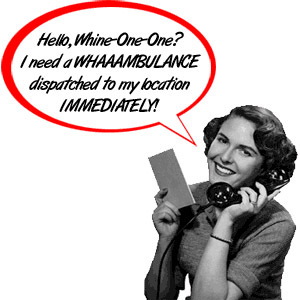 Most times I am sure people are not aware that they are complaining and whining as much as they are. I am not perfect and have, at times, found myself falling into the trap of posting a whine or complaint about something in my life as well. This week I had a real learning experience as it relates to my “status” posts on FACEBOOK. I was not feeling well. I found myself posting how frustrated I was at not feeling well when I had a day off from work. Seemed innocent. I mean who really reads the status posts and who really pays attention to them? Right? It’s Monday morning, I sit in my office preparing for another week of work. I am waiting for one of my employees to come to work. I hear Laurie’s voice from the front of the main office and she is talking to her co-workers as she heads down the aisle heading towards my desk. Before I know it, Laurie pokes her head into my office and she is smiling. “Good Morning!! !” she exclaims, “How are you feeling? I read on FACEBOOK that you were sick all weekend”. I wave her into my office and ask her to sit down and I proceed to tell her that I still wasn’t feeling the best and just start listing my aliments to her. As I continue my complaint, I look up and it is then my selfish thoughts and words drift off into a mixed up unintelligible mumble. For it is then I see this woman, who has a look of genuine concern for me on her face, is sitting there with a red bandana wrapped tightly around her head. Her beautiful long hair long-lost from the chemo treatments. She is 70 lbs lighter than she was the day she told me she had to leave early for a doctor’s appointment. Today is her first day back to work in over a year. Truth be told, I was not even aware that I had complained on FACEBOOK that I was sick. I quickly moved the conversation to discussing her return to work and how happy it was to have her back. I showed her to her desk and went over the day’s agenda. When I could, I made my way back to my computer and logged on to FB to see exactly what I had posted. Sure enough…there it was. My complaint about a very temporary event in my life was clearly written on my status. I then click on Laurie’s FACEBOOK profile and start reading her posts. Not only was I embarrassed by complaining of my cold to a woman who has been struggling with cancer for over a year, I was humbled by the fact that every single post on her profile was not a complaint or a whine. Her posts were different from most I had read on FB. She took joy in the moment… she was thankful for another day…the warm day… the cold day…it didn’t matter. She was thankful for the gift of another Christmas. She did not complain or whine about her job, her co-workers, her kids, politics or her husband. She did not complain about how long the week was and how short the weekend’s were. She did not complain about the mess in the house nor did she list all things she had to do in order to get a little time for herself. She was simply satisfied with getting another chance with another day. I was ashamed and was clearly reminded that I have no business complaining about anything in my life. It is estimated that the average person is said to complain nearly 15-30 times a day! As much as we might want to believe that complaining is something that only others are guilty of, the truth is that we are all complainers. Regardless what term you use to describe it — such as griping, grumbling, whining, or belly aching it is still complaining. The Bible commonly uses the term “murmuring” to describe what many of us do. It has the same symptoms for all of us…unhappiness, dissatisfaction and discontent. The question that burns in my heart and mind is why? Why are we so dissatisfied with our life? Why so unhappy? Why the discontent? Probably what bothers me most of all is the fact that I see the FACEBOOK posts from only t hose that I am “friends” with. I currently have 350 people who have befriended me on FB. Considering my background as a graduate from a Christian College (Liberty University) and the fact that I was a former Christian School Administrator and have been actively involved in the Church since I was 10 years old, the vast majority of those who I am friends with are people who would define themselves as having a personal relationship with Jesus Christ. Again…the burning question…why the discontent, the unhappiness and the dissatisfaction? I would like to believe that the reason for all of this could be tied to just being immature. We accept Christ as our Savior, then fail to grow into mature adult Christians. Then again, maybe it is tied to being just selfish and self-centered. I do know some people who I call “axis people” …you know people who believe that the axis that the world revolves around is wherever they are standing. The world just revolves around them and what happens anywhere else just doesn’t matter. As much as I would like to use these simplistic reasons to explain all the whining and complaining I see, I believe it is something more serious and heart-breaking. I personally believe that it stems from a basic core of unbelief in our lives. Sure we believe enough to cling to the fact that we acknowledge that Jesus Christ paid the price for our sins by His death on the cross. We believe and trust that He has saved us and has prepared a place for us in heaven. In other words…we believe that God will “take care” of us in eternity. However, we honestly don’t believe that God can take care of us in this world. If we honestly trusted and believed in God’s ability to take care of us then there would be no need to complain as we do. We would be more content because we would finally accept the fact that God places us exactly where He wants us to be. Regardless of whatever circumstances may cause discontent or dissatisfaction, complaining is an expression of unbelief toward God’s order in our life. The whole premise of Christianity is that Jesus becomes the Lord of our life and our circumstances. They are in His hands. If you as a believer complain, it really becomes an accusation against our Lord, in whom you’ve trusted your life. As we look back into the Old Testament and see how God dealt with the Children of Israel, we discover that the Lord always considered their complaints as an act of unbelief directed toward Him. When they complained about their circumstances, their type of food, and even at Moses, God was displeased because they weren’t thankful for what He had provided them. He was disappointed that they refused to trust in Him to provide, protect, and direct the order of their lives. “Now when the people complained, it displeased the LORD; for the LORD heard it, and His anger was aroused. So the fire of the LORD burned among them, and consumed some in the outskirts of the camp” (Numbers 11:1). I believe that the whining and complaining is unbelief in God’s Word. Romans 8:28 says “…all things work together for good to those who love God, to those who are the called according to His purpose“. If you call yourself a Christian and you say that the Lord is in control of your life, and is working “ALL THINGS together for our good,” you should stop complaining and start thanking the Lord for the plan He is working together for us. The Apostle Paul tells Christians to do all things without complaining (Phil. 2:14), and the epistle of Jude places complainers in the same category as ungodly sinners who will inherit judgment: “…to execute judgment on all, to convict all who are ungodly among them of all their ungodly deeds… These are grumblers, complainers, walking according to their own lusts…” (Jude 1:15-16). Complaining is common-place in the lives of unbelievers who have no trust in God, but Christians should be people of faith, filled with gratefulness and thanksgiving. Sometimes I wonder if I am the only one disturbed by what I read on FACEBOOK. I think I have a right to be concerned, but it isn’t limited to just FB. Twitter is just as bad. I have read post after post where a brother or sister in Christ writes something that takes away from their testimony. Maybe it is an attempt to be funny or sarcastic. Either way it does nothing but cause people to think of that person as a hypocrite. God knows my heart, I am not trying to judge anyone here. I am just asking that we as believer’s need to watch what we post and how it could be interpreted by others. Especially by those that are our friends that are unbeliever’s and those that are young in Christ. Too many Christians seem to think that it is alright to post a Bible verse one minute and then follow it up with a statement that totally contradicts their faith. Do we really become so self-absorbed that we forget that other people read our posts? We have a responsibility to remain true to our faith and to our testimony. Most people will only see the Jesus Christ they see in you. What are you showing them? So I am proposing for all of you to consider taking up a FACEBOOK Challenge. 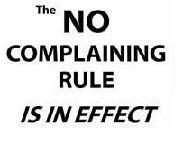 I am challenging all of us to STOP all the whining and complaining. 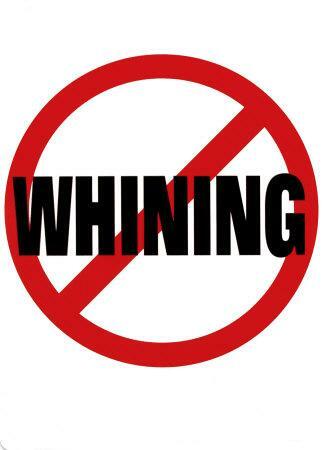 I am declaring it a “No Whining Zone” This is my challenge to all of you. Quit your whining about work, quit complaining about all of your most meaningless and trivial issues in your life. Instead of complaining that Monday is here, say a prayer that God would work through you to bless those you meet this week. Thank Him that you’re still working when many people are not. And most of all, please stop posting on Facebook how excited you are to get to the weekend where everything will be about “you”. If God could work for six days and call everything He did good, so can you. Do ya think any of my FACEBOOK friends will “unfriend” me after this…..? When You’re Fifteen, it’s a Long Way to Cleveland.